We caught a preview of Stanzie Tooth’s second solo show titled Inhabited at General Hardware Contemporary and, spoiler alert, it’s amazing. 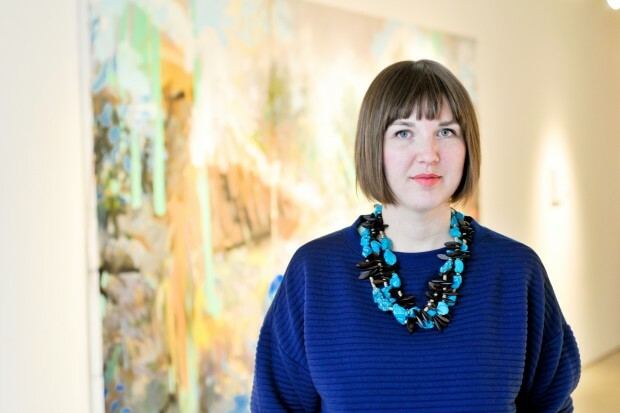 Each painting creates a window into her childhood world of rural Ontario landscapes. The images are mythical and dreamy, yet grounded. 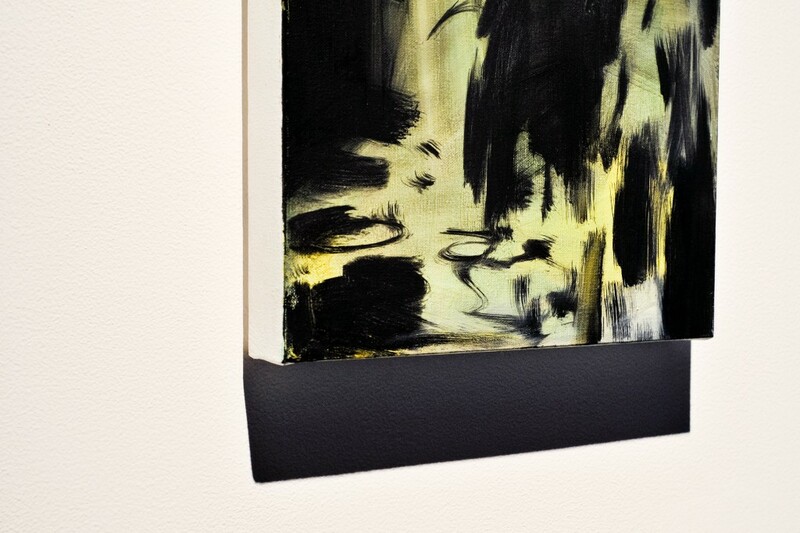 They’re memories of a tangible place transformed by paint and Tooth’s gestural mark. In her previous work (fun fact, Tooth was our very first studio visit! ), she references sourced images but this latest collection relies on remembered emotions and locations. By following the gesture of her paintbrush, allegorical figures are conjured up like symbols from a dream. The viewing experience feels like a glimpse into Tooth’s subconscious, a place that will likely enter yours as well. It’s been a long time since we’ve seen your work in person! What have you been up to? There’s been a big opening up in the work. I stopped using image references in my work completely and it’s more about having a conversation with the painting to develop the image. How does that compare with your previous process? Before, I would find images and build a narrative, then render it in my style of painting. Now I’m much more interested in opening up the gesture in the work and the physical quality in the work. The gesture guides the painting, and not the other way around. I have a constant studio practice of mark-making. It’s an everyday routine of making marks and letting them conjure memories for me. You’re finishing the MFA program of the University of Ottawa and have always had a strong academic background for your work, but I love that it’s also very physical. How do you keep balance between brain and brawn? There’s something about art that defeats language. If I could write about this work, or speak about it and explain exactly what they do, I wouldn’t need to make paintings. That’s been the impetus of how the work has changed. I wanted it to be less narrative-driven and more physically-driven. There’s definitely narrative or allegorical images that appear in the work, but I’d rather them be the result of this process. Did you experiment with any other mediums or disciplines during your MFA program? I did. I was experimenting with collage for awhile. I was doing lots of work on paper. Part of that was because I had surgery last year and wasn’t able to paint for awhile. My appendix exploded at Christmas last year. For awhile, I was doing these tight, confined paper works and when I got back to painting there was this explosion. I wanted to let loose and stretch the boundaries and material as much as I could and play with it that way. Was there anything else that influenced this shift? I think when you’re younger, you want to be understood in a more direct way. We create a narrative so that we show people a story. I came to art through dance and theatre originally. When I started painting, it was with this narrative concept. I had done set design, so I thought I had to make character-driven work because, for me, that’s what art did. As I’ve become more confident in my painting, I care less about that and it’s more about what sense I can imbue in something. What can I conjure? I’m really in love with the physicality of paint right now. I see figures forming in the landscapes–are they planned out? None of them are planned. I wish I knew how to plan. So many of them happen as accidents. I don’t know how I would replicate it. I love the paintings that happen in the most spontaneous way. What draws you to landscapes? 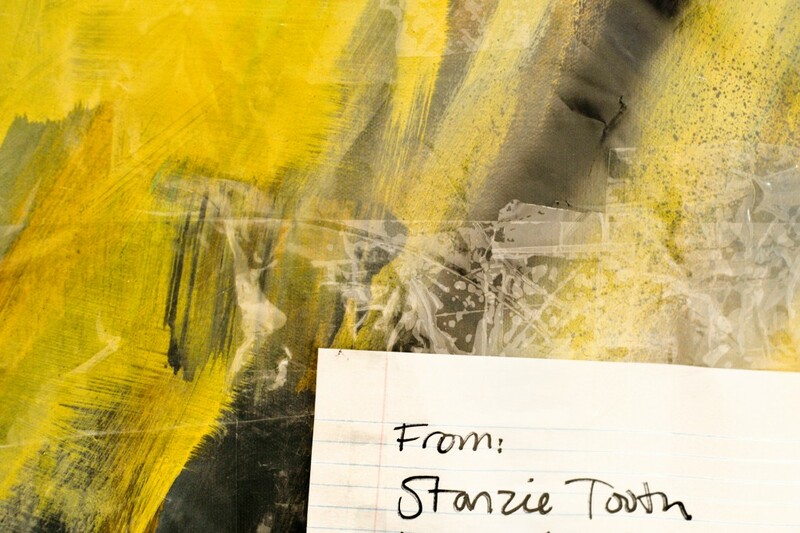 Visit Stanzie Tooth’s website here and read her Studio Beat visit here.